The epic conclusion to Christopher Nolan’s The Dark Knight trilogy, The Dark Knight Rises, comes out December 3 and in the build up we were sent a list revealing some behind the scenes facts from The Dark Knight Rises - and even though I am the biggest Batman fan even I was surprised by a couple of them. 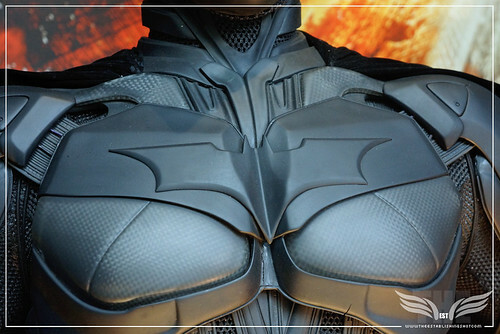 The Establishing Shot: Christian Bale's original Batman Costumes from The Dark Knight Rises Chest & Bat Symbol Detail - London, a photo by Craig Grobler on Flickr. 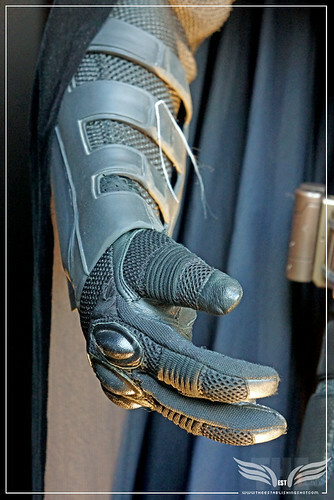 The Establishing Shot: CHRISTIAN BALE'S ORIGINAL BATMAN COSTUMES FROM THE DARK KNIGHT RISES GLOVE OUTER DETAIL - LONDON, a photo by Craig Grobler on Flickr. 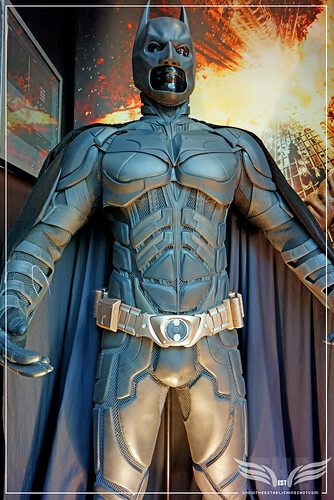 • The Dark Knight Production team created 50 capes in total, varying in length, shape and size to reflect different functions such as trailing, walking, action/fighting and mechanical. 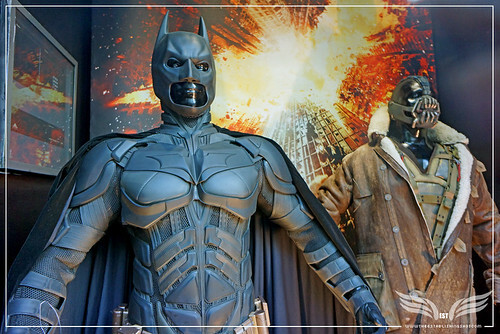 The Establishing Shot: CHRISTIAN BALE'S ORIGINAL BATMAN COSTUMES FROM THE DARK KNIGHT RISES - LONDON, a photo by Craig Grobler on Flickr. • The cape is made from a fabric which is electro-statically flocked, taking advantage of a process used by the UK's Ministry of Defence when minimum night vision detection is required. • The Special Effects department has invented a brand new type of silent, directional wind machine for use in creating the billowing cape image inspired by iconic comic book illustrations. • According to The Hollywood Reporter, Anne Hathaway’s stunt double broke one of the IMAX cameras when she crashed the Batpod into it. This marks the second time an IMAX camera has been destroyed on a Christopher Nolan Batman film - a previous camera was smashed when filming the Joker's underground truck chase in The Dark Knight. • Anne Hathaway has revealed that during her audition, she thought that she was auditioning for The Joker's on again-off again girlfriend/partner-in-crime Harley Quinn. it was only after she had a discussion with Christopher Nolan that she found out that she was auditioning for Catwoman. • The Batmobile was designed by Christopher Nolan and Production Designer Nathan Crowley in the filmmaker's garage in Los Angeles. The prototype was made by sticking together toy cars, eventually combining a Hummer and a Lamborghini – the inspiration being an ex-military vehicle. 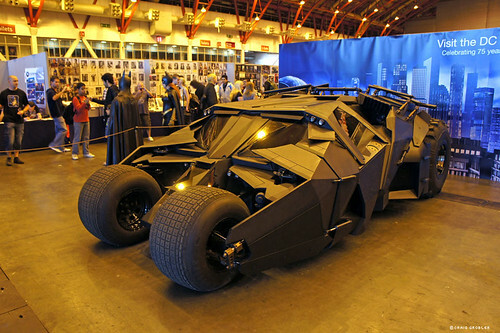 The Establishing Shot: LONDON FILM AND COMIC CON - THE TUMBLER BATMOBILE, a photo by Craig Grobler on Flickr. 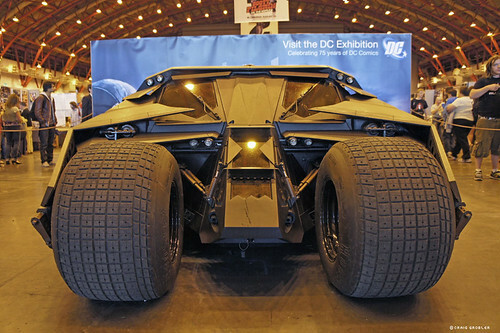 • Everything on the Batmobile has been built from scratch. It is not an existing vehicle that has been remodeled or customized. 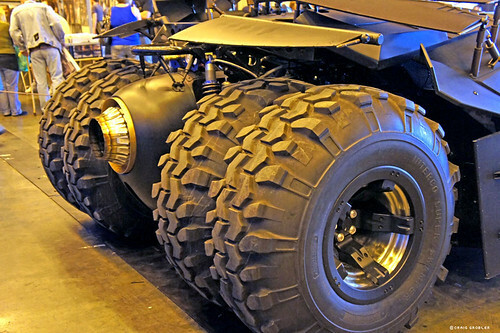 • The Batpod is designed and developed to give Batman a swifter mode of travel around Gotham City streets. Like the Batmobile, the bike is fast and ferocious and perfectly suited for hostile situations. It is built for all-terrain surfaces and equipped with three guns on each side: a blast cannon, a grappling gun and a machine gun. • The Bat is an urban airborne vehicle—part helicopter, part jump jet—designed by Nolan and Nathan Crowley and built off a miniature by Chris Corbould’s team. • The Bat is given the illusion of flight in a number or ways; under a helicopter, on high wires, on wires suspended from a crane, mounted on its own vehicle and even on a track when it is shown bursting through surfaces. 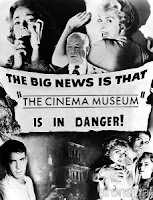 • According to producer Emma Thomas, the filmmakers elected to shoot the film in Pittsburgh to emphasize Gotham's immense size and scope and because "they literally shot every inch" in Chicago, where the previous two films were shot. • In the football stadium sequence, the cast and extras are all wearing heavy winter clothing, though the scenes were shot during a massive heat wave across the East Coast during the summer of 2011. • In a fighting scene shot at Wall Street, Bane actually fought actual policemen patrolling the area. As per the director, due to presence of so many actors in the fighting scene things got pretty confused and Bane was unable to differentiate between the actual policemen and actors and ended up fighting with actual police. • While doing promotional interviews for the film Tom Hardy stated that the most difficult parts of the movie to shoot were the fight scenes. 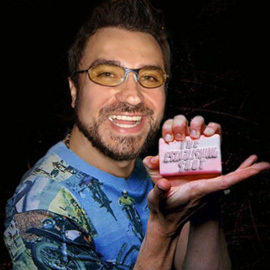 Not because of the physicality of them, but because he was such a huge Batman fan growing up that he said "it felt like I was beating up my childhood hero". • The original story treatment by David S. Goyer was to have Two-Face as the principal antagonist for the film. Initially, at the end of The Dark Knight, the Joker would have scarred Harvey Dent at a courtroom trial, setting up the third film. Dent's death and fall was put in at the end of the second film instead to set up the aftermath that follows. 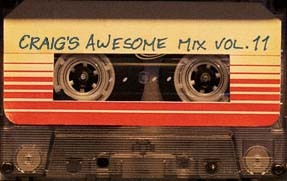 • At 165 minutes long, this is the longest Batman film released to date as well as the longest film that Christopher Nolan has ever directed. 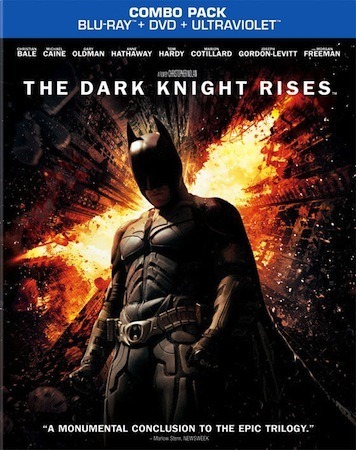 • Each movie from the Dark Knight trilogy is 12 minutes longer than the previous one (Batman Begins is 140 minutes, The Dark Knight 152 and The Dark Knight Rises 164).